You stay in our spacious, newly renovated rooms, close to the countryside and Kolmarden Wildlife Park. Within easy reach of the E4 motorway and with plenty of free parking. Enjoy a dip in our pool, relax in our sauna and banish those hunger pangs in our restaurant. Enjoy a good night's sleep in one of our hotel rooms designed in Scandinavian style, with wallpaper inspired by the natural surroundings of Ostergotland. Exercise in our gym, take a dip in our 25 degree pool or relax in our sauna. Our restaurant serves delicious, traditional food which we adapt to suit your needs, and we have a playroom for the kids. 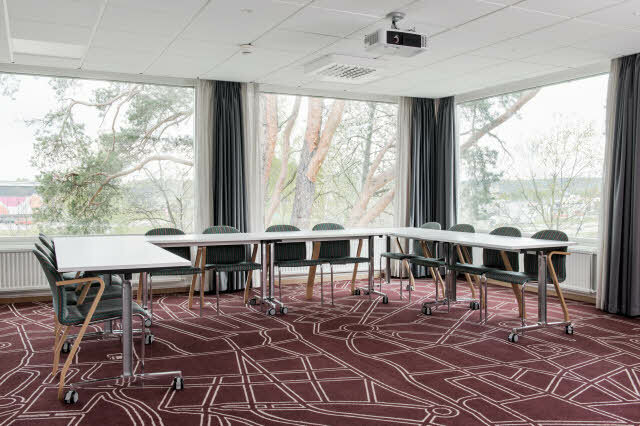 Choose from 11 well-equipped meeting rooms for your events and conferences that can accommodate up to 110 people and have WiFi. Our hotel is easy to reach and peacefully located in the northern part of Norrkoping. Within easy reach of the E4 motorway and close to Ingelstad shopping area. Kolmarden, the largest wildlife park in Scandinavia, is located just 25 minutes away by car, and Norrkoping Airport is just over 10 km away. It's easy to hold your meeting with us, whether you wish to book an event or last-minute meeting. We offer 11 modern meeting facilities for meetings, events and conferences of up to 110 people.